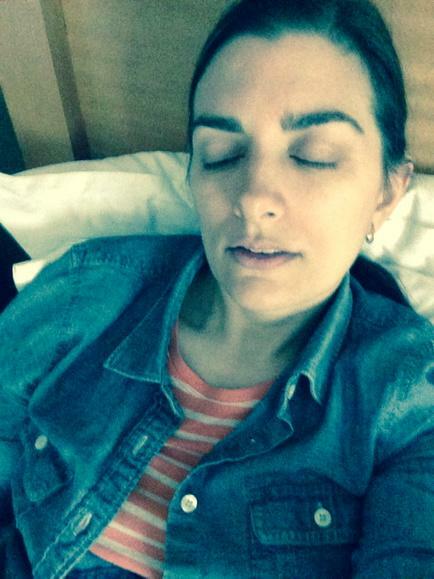 Sorry no fun links or Twin Peaks weirdness: I have been so sick. The kind of sick where you want to curl up and die. The kind of sick where if you are lucky, your lovely mother will come and take your baby and shoo you into bed and bring you cautious sips of liquid. I am finally keeping down a little soda and feeling slightly human, slightly surreal. This will hopefully help me write something interesting this week. Tl;dr, I’m super sick and my mom is the best. By now, you’ve probably heard of the incredibly successful (or disastrous, depending on your point of view) Lilly Pulitzer line at Target. Whimsically patterned women’s dresses, girls’ clothing, and housewares sold out the very first day by 8 am in stores–and demand crashed the Target website. $40 dresses have been cropping up on eBay for $650–especially ridiculous when you can buy a non-Target Lilly Pulitzer dress from the designer’s website for about $200. Oh my god Veronica, I’m having so much fun hanging out in my Target Lilly Pulitzer dress! Now, a lot of bloggers are not only annoyed at the aftermarket-fueled frenzy–and Target’s supply, which was apparently only a fraction of the demand–but they’ve been critical of the Lilly Pulitzer look itself, calling them “phenomenally boring and showily tasteless shift dresses” for vapid, wealthy, status-conscious women. Nice knockoff, Betty, but I’m having even more fun hanging out in my Paris original* Lilly Pulitzer! You know what else Lilly Pulitzer dresses are? They are colorful, classic shift dresses. You know what they’re good for? Everything. Especially in the summer. Throw on one great-fitting shift dress–just one piece of clothing–on a summer day, and you’re ready for everything from a day at the beach to a frickin’ wedding. Even better: if you know how to sew, shift dresses are easy and (relatively) economical to make, which means you can avoid eBay and make your own Lilly Pulitzer dress yourself. Now: I cannot teach you to sew via this blog. The very idea of the time and effort (and photos) involved makes my hair stand on end, and at the end of the day, they still probably wouldn’t help a novice sewer in the long run. I myself was taught by my lovely mother–her mother sewed all of my Mom’s and her sisters’ clothing in the ’50s and ’60s. So if you don’t know how to sew and would like to learn, find a friend, family member, or class that can help you. It is a worthwhile skill to learn, and not terribly difficult. It’s just much more effectively learned in person, from a person. But! If you know how to sew, I’ve found some patterns and fabrics that are quite Lilly Pulitzer-esque, and I’ll share them with you! The sleeveless version of New Look 6176 looks very Lilly Pulitzer-like: a simple, classic shift dress that can be made with about two yards (or less) of material. The sleeve and pocket variations offer some flexibility, too. I like my second “Lilly Pulitzer” pattern, New Look 6095, even better for three reasons: one, it doesn’t have the banded neckline that 6176 has, so it looks even easier. Two, I like the different contrast band options at the waist and hem. And three, you can make a matching bag if you want! Now as any sewer worth his or her salt can tell you, finding a pattern is one thing–finding the material is another. Luckily, Amy Butler is known for her gorgeous, colorful fabrics, and I found a few on her site that fit the bill nicely. Henna Paisley Pink is a gorgeous print in a classic Lilly Pulitzer green and pink color scheme. Daisy Shine Confetti is another colorful floral print that would be perfect for a Lilly Pulitzer-type shift dress. Leaf Lines Jade might be my favorite choice–I love the cool green tones and the graphic simplicity of the shapes. There’s a store locator on the Amy Butler site, but any local fabric store should be bursting with colorful prints right now! I’d estimate that you could make one of these dresses for around $40 (the Target price)–figuring fabric at about $12 per yard. However, your “Lilly Pulitzer” dress will have the advantage of fitting you just right (if you’re at a level where you can make basic pattern adjustments) and you can choose the patterns and colors you like best. It would also be pretty simple to add lace and other trim to get the look you want. Okay, I’ve convinced myself: I may have to make myself one, if I can do it while Sarah takes her naps. I’ll post pics if so! 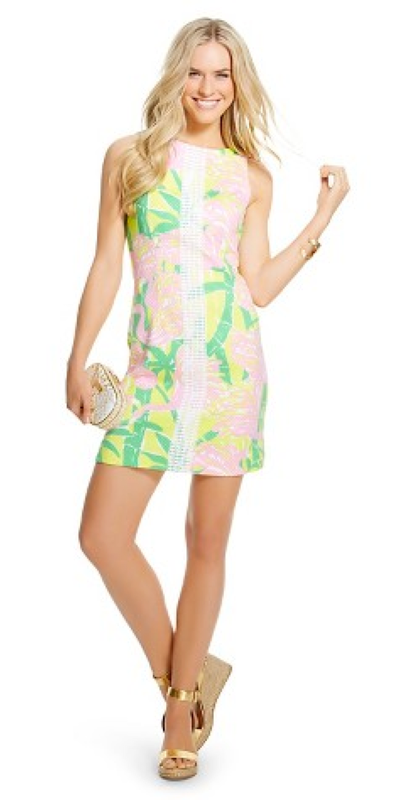 Did you run out and get a Lilly Pulitzer dress at Target? Do you think they’re the anti-fashion? Post your comments below! And here is the conclusion of my epic 10-day, 2-state, 10-Item Wardrobe! Last month my family and I spent spring break flying from coast to coast to coast: from warm Oregon to snowy Massachusetts for a week, and then to wet Seattle for Emerald City Comicon. Since I was traveling with a husband, kid, and baby, I wanted to pack as lightly as possible, while still having all my bases covered. Inspired by Jennifer L. Scott of The Daily Connoisseur, I put together a 10-Item Wardrobe, which consisted of 10 core items plus some extra T-shirts, and I was pretty pleased with the results! You can read my initial post here, and check out the first five days here. Archie and me (and Sarah) checking out downtown Ipswich. On the sixth day of our vacation, Scott, Sid, Sarah, and I walked around the quaint town of Ipswich, where Scott grew up. Because the walk was led by my crazy husband, it included a lengthy hike along a snowy riverbank while he encouraged our 10-year-old son Sid to kick large clumps of snow into the water. My black cardigan, favorite Archie T-Shirt, and blue jeans did the trick, topped off by my all-weather black trench coat. I was super happy my Ahnu sneakers withstood the snow and kept me upright. 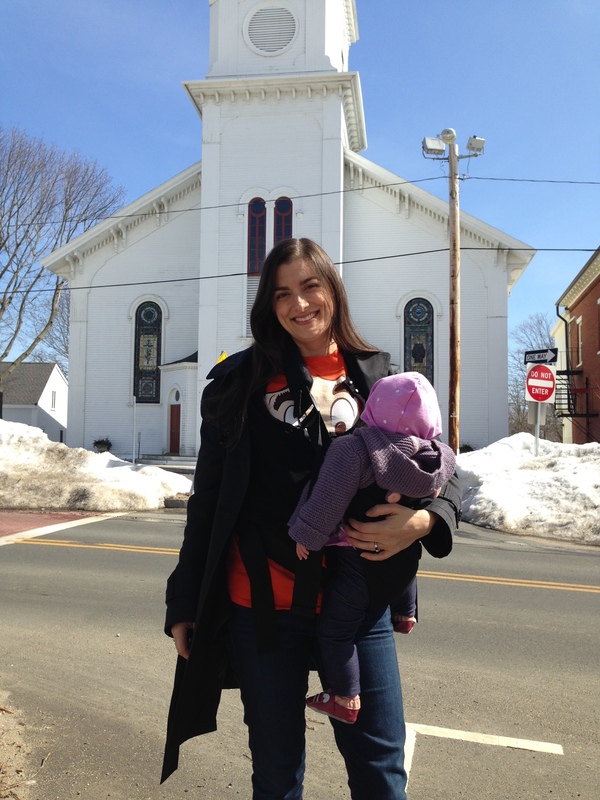 Visiting with Bewitched‘s Samantha Stephens in Salem, Massachusetts. 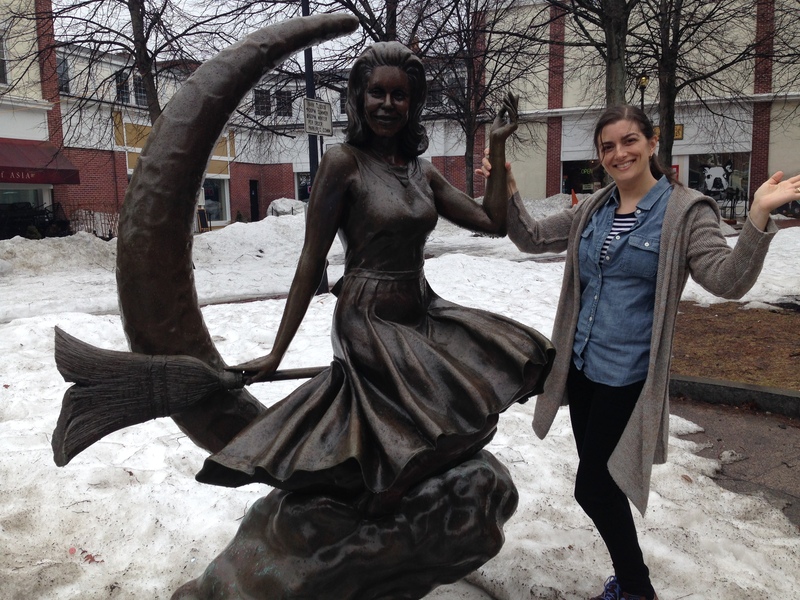 On Day 7 we went to Salem, Massachusetts to visit more of Scott’s family, and I just couldn’t spend time at the site of America’s infamous witch trials without getting a pic with Samantha from Bewitched! 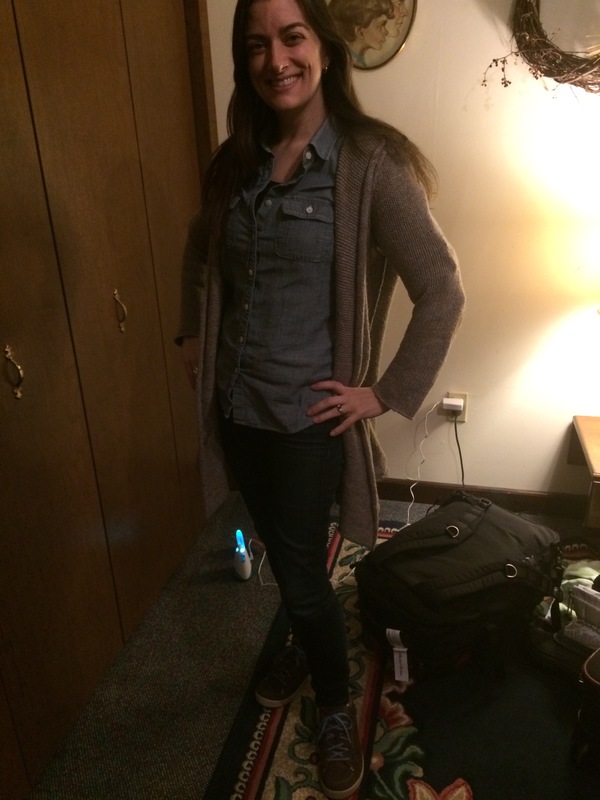 Since we were going in and out of doors all day, I layered up: my grey sweater, chambray shirt, striped Gap T-shirt, and black jeans were comfy and warm (also, I swear I was wearing a coat, but took it off for the picture). Are we there yet? At the Sheraton Hotel in downtown Seattle. 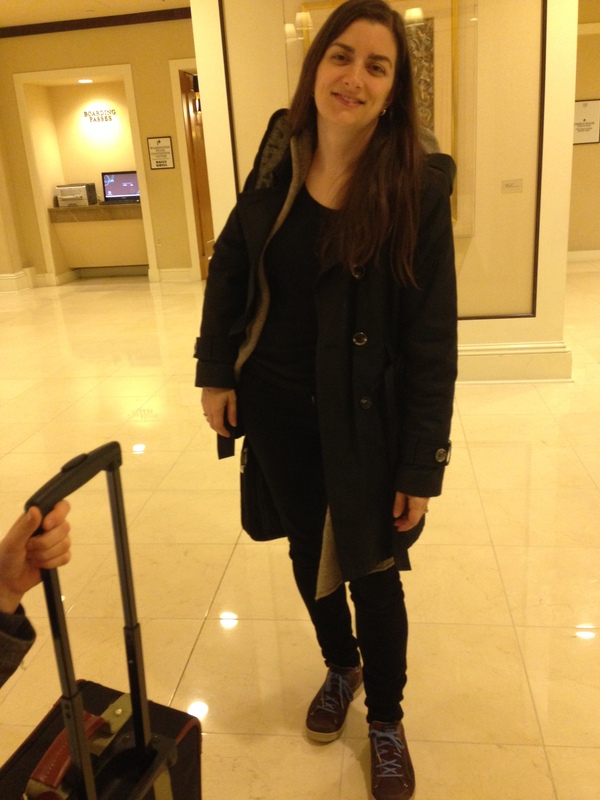 On Day 8, we had a long flight from Boston to Seattle, finally getting to our hotel at 11:30 pm. And our hotel got our room wrong (this was quickly fixed by Dark Horse Comics MVP Kari Yadro). To survive the long flight (and many hours of Sarah sleeping on my lap and cutting off my circulation) I chose my grey sweater (again, it’s my favorite thing ever), black T-shirt, and black jeans. Getting ready for Emerald City Comicon! Day 9 was an historic day: it was my seventh ECCC, and it was my first not working at the Things From Another World booth. I celebrated (and mourned a little) by putting together a very daring outfit, layering my Spider-Man sweatshirt over my Archie T-shirt. Scandalous! I put on my black jeans, strapped Sarah to me, and hit the floor! So . . . tired . . .
Had a great time on the floor at ECCC on Day 10, picking up the latest Love and Rockets graphic novel, a couple of books by Lucy Knisley, and a sweet sketch of Betty as Power Girl by Archie Comics’ Dan Parent! 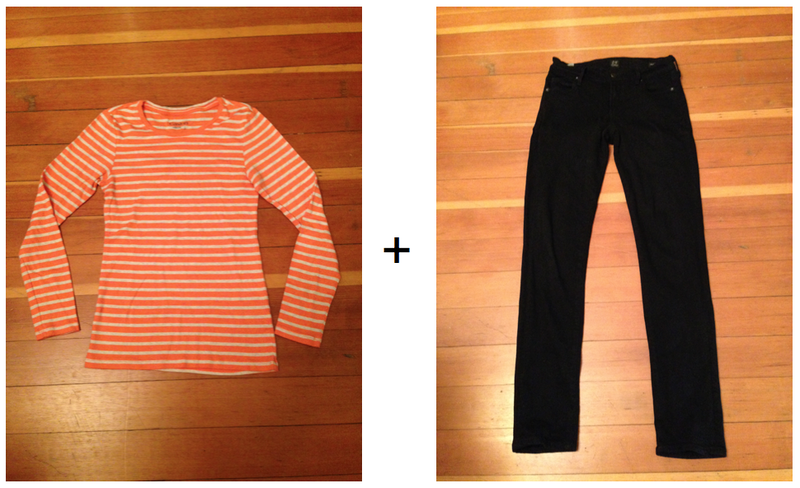 I dressed for comfort in my chambray shirt, orange-striped tee, and blue jeans. Most importantly, that’s the day we finally drove home and got into our own beds! Yay! 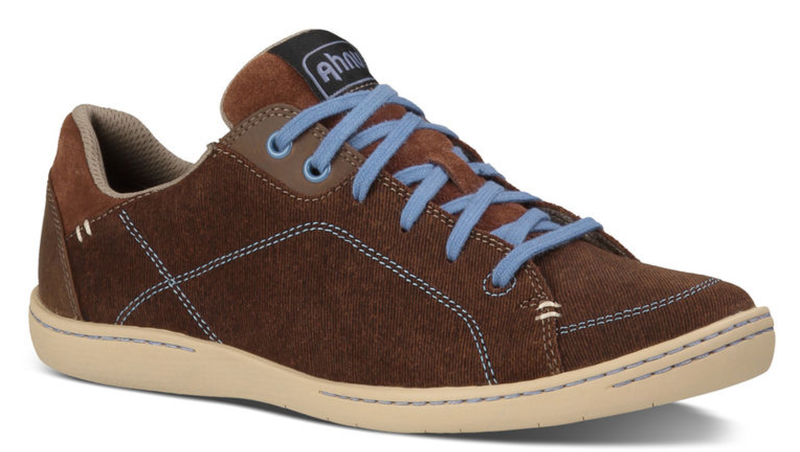 The MVP of the trip was definitely my Ahnu Noe sneakers in Cocoa, which were amazingly comfortable and good in the snow and rain. I wore them 10 days straight without breaking them in (or even wearing them) beforehand, and they were stellar. No blisters! No leaks! Even with my streamlined wardrobe, I could have brought less! The grey jeans were a last-minute addition–I was second-guessing only having two pairs of pants for the trip–but I think I only wore them once. The extra Gap T-shirts were also unnecessary. It’s been really cool going through the pictures day by day! 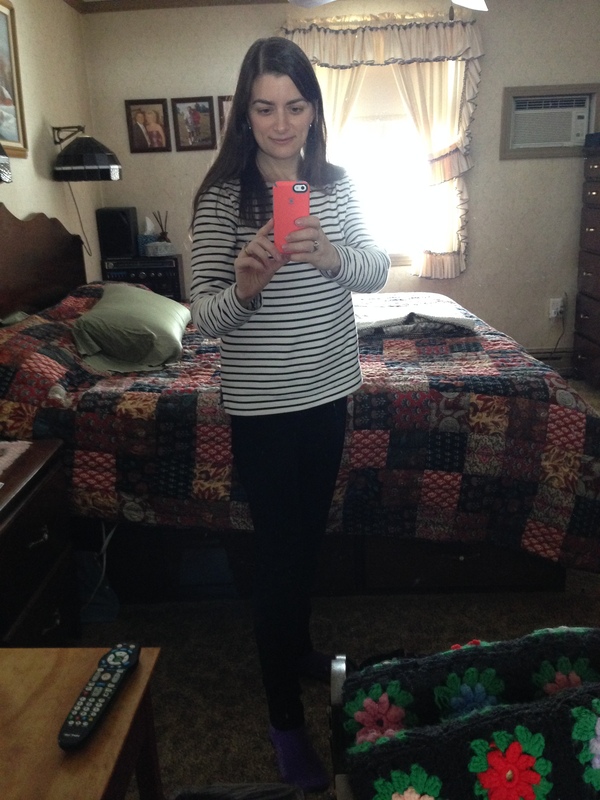 Obviously I know what clothes I have and wear, but I really got a good look at what my “style” is (stripes). Have you ever done a 10-Item Wardrobe? What would you include? Post your ideas below! On Monday, April 20th at 9pm ET, I’ll be a panelist for a #NoFoodWasted Twitter party hosted by Green is Universal. So I thought I better write up some of my best food-waste-busting ideas in preparation. Happy Monday, everyone! Hope your weekends were lots of fun. Mine was jam packed: not only did we have two brunches (one at our house, one at Sid’s Mom’s), but we hosted our epic Twin Peaks Dinner on Saturday, and it was awesome! 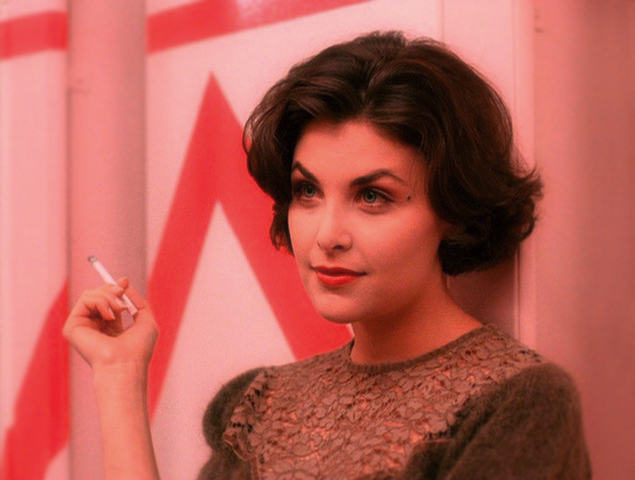 I’ll post a pic here, but I’ll do a full Twin Peaks party post later this week. Cobbling together the decorations and the food was fun, but the best part is how my friends ran with it–the costuming was superb. 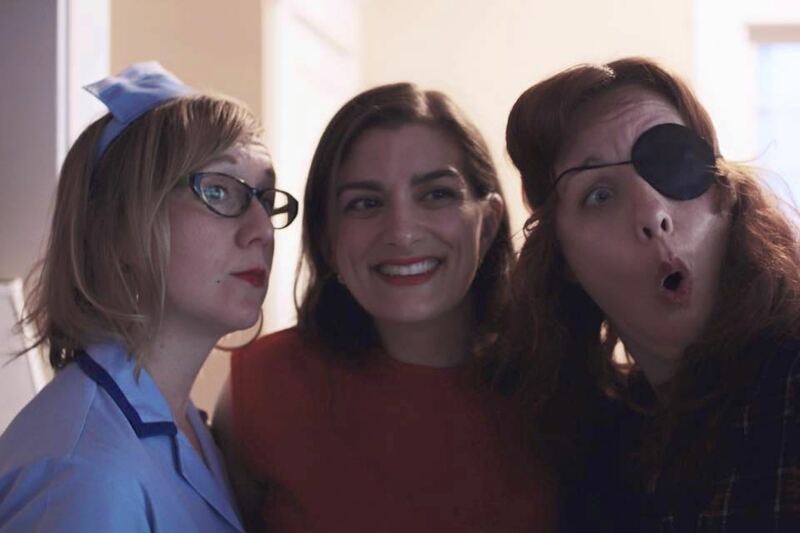 Shelly the waitress, Audrey Horne, and Nadine at our Twin Peaks Dinner. Photo by Jewel Mlnarik. Now, without further ado: links! Are you currently living under a rock? Do you (wrongly) feel you’re too cool for Star Wars? Just go watch the new teaser already. I’m also loving this Star Wars comic strip by Dan Hipp–it shows exactly how I felt watching the video. If you’re a regular reader, you know how much I love Jennifer L. Scott’s 10-Item Wardrobe videos. Here she does a talk through of her Spring/Summer wardrobe. I’m currently putting together my own Spring/Summer wardrobe (because I’m a fancy lady, and I also like having clean drawers and being able to get dressed in five minutes), so I’m tempted to check out Boden. Need a laugh (especially if you, like me, used to work in the service industry)? 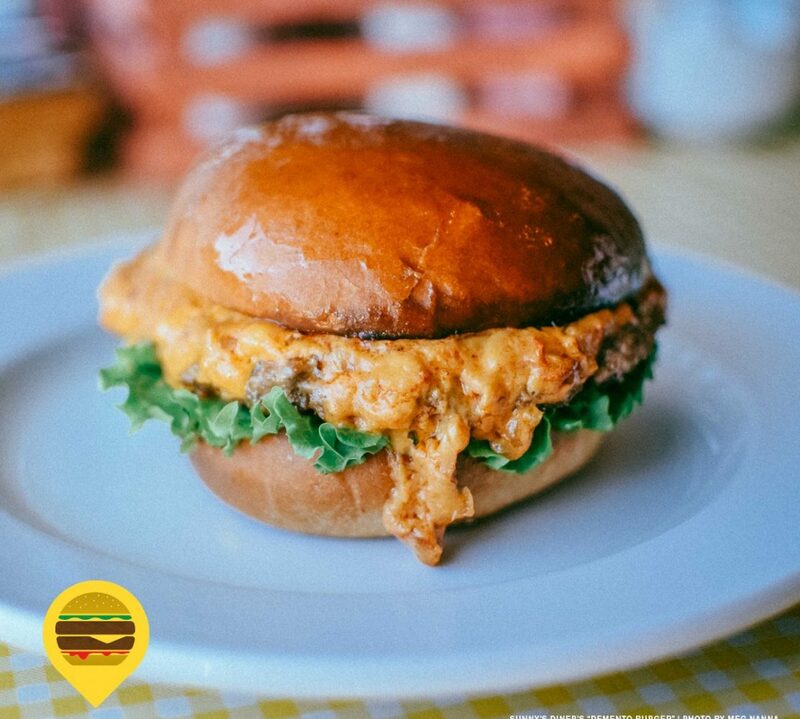 Kitchenette’s Behind Closed Ovens column this week is titled Misfires and Meltdowns of Terrible Restaurant Employees. And, to end on a somber note, I was truly saddened to hear that Jonathan Crombie, Gilbert Blythe from the classic Anne of Green Gables television movies, passed away at the age of 48. The books and movies were a huge part of my childhood and adolescence, and my thoughts are with his family. Time to watch Anne again this week. Gonna finally wrap up my 10-Item Wardrobe posts from my vacation, and I swear I’ll post some recipes, too. Now I gotta play with my baby! Yay, I finally got a 10-Item Wardrobe post off the ground! I’m sure you were waiting with bated breath. The reason for my delay was two-fold: one, a lot of the photos I took didn’t show the clothes terribly well, so I put together some extra images. Two, I had a little performance anxiety. After all, it’s not like I’m the most fashionable lady–who really cares what I’m wearing? However, I reminded myself that the 10-Item Wardrobe isn’t about following the latest fashions, it’s about finding the things that suit you. Out of necessity, everything I chose had to be something I loved to wear–and each piece had to go together and be reliable, too. Because of this, I was able to get dressed in less than five minutes every day, which gave me extra time to enjoy my vacation (or . . . change a diaper). Okay, to refresh: we went from warm and springy Oregon to cold and snowy Massachusetts for a week, after which we traveled to warmish and wet Seattle for Emerald City Comicon. That meant I had to pack flexible items that could be layered for warmth, and dressed up or down. The first five days were all in Massachusetts! From the PDX airport to Massachusetts! For Day 1, I needed ultimate flexibility, an outfit that would work for a five-hour plane ride and be suitable for snowy Massachusetts, so I chose lots of layers! Here I have my black T-shirt, topped by my chambray shirt and my trusty, favorite grey sweater. I paired these with blue jeans and my Ahnu sneakers (which I put on for the first time on Day 1, and wore every day for the rest of the trip–no blisters, no nothing)! Day 2 was primarily spent at my husband’s parents’ house (after our morning trip to Dunkin’ Donuts, of course). My J Crew striped shirt and black jeans were comfy and still made me look presentable in front of Scott’s many stepsisters. 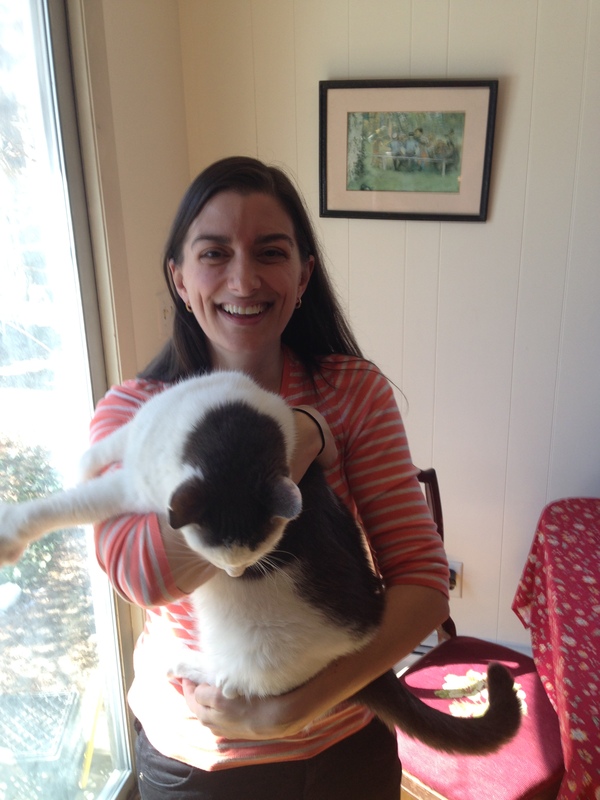 Off to Martha’s Vineyard to visit friends (and my cat)! Day 3 was another long day of travel, as we got up early (so early) to drive down to Woods Hole to grab a ferry to Martha’s Vineyard, where I used to live. Again, I needed something that looked sharp (I was seeing at least one ex-boyfriend, for heaven’s sake!) but felt comfy. And was striped, apparently. Anyway, I went with my orange striped T-shirt and my black jeans (because I could easily find them in the dark–again, oh it was early). 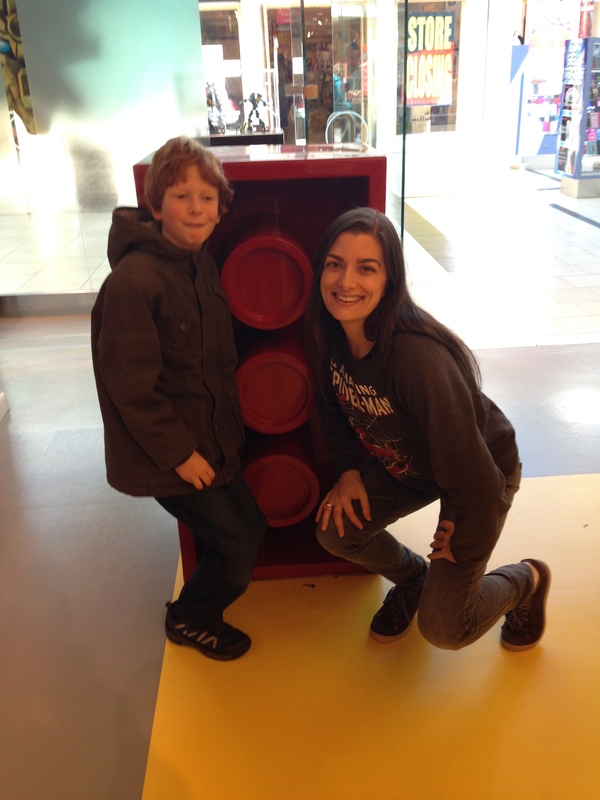 Playing at the LEGO store with Sid! After all our travels, Day 4 was a day for relaxing . . . and shopping! Scott’s mother took us to the mall to spoil the grandkids, which of course included a trip to the LEGO store for Sid. 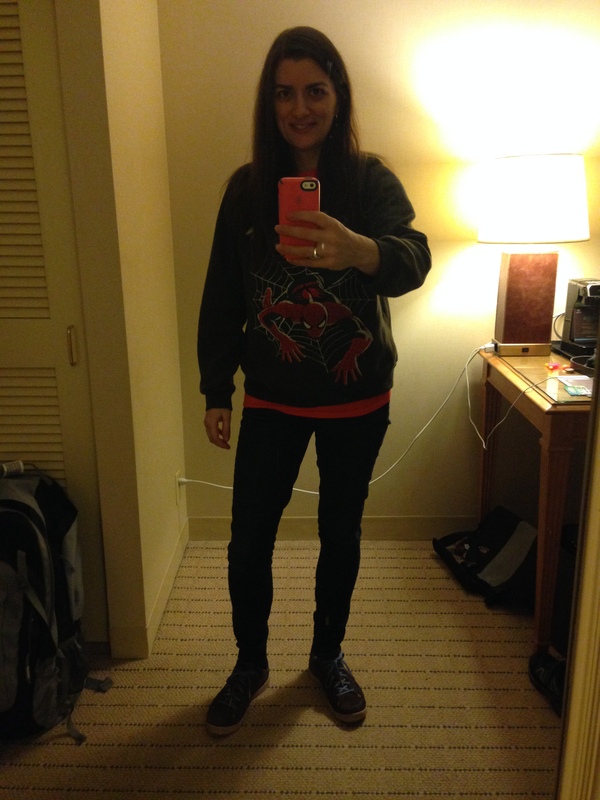 I dressed for the weather and my own interests with a black T-shirt, my awesome Spider-Man sweatshirt (so cozy! ), and my grey jeans. On our morning trek to Dunkin’ Donuts. 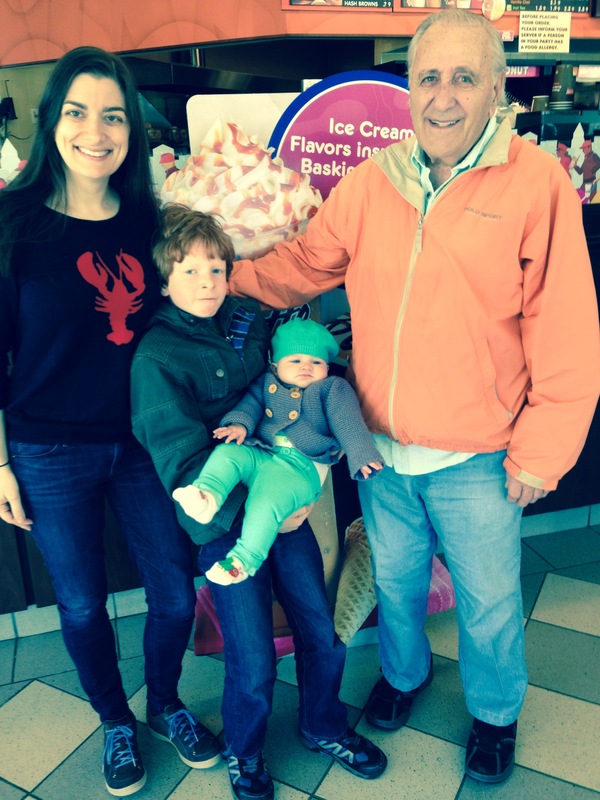 Sid, me, Sarah (in a new outfit from Nana Debbie) and Gunny! Day 5 was a momentous day. A day I’d been looking forward to all year: lobster roll day! Scott’s mom makes incredible lobster rolls, and as a special treat, she made as many as we could eat. 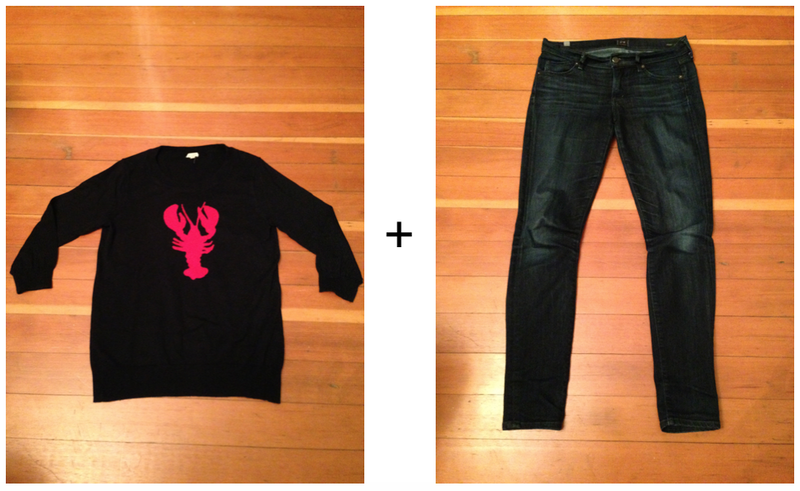 What else was there for me to wear but my lobster sweater and blue jeans? So there’s the first five days! I’ll have the next five days up tomorrow. Oh, the suspense! What striped and/or comic-book related clothes will I possibly wear?!? In all seriousness, looking over the first five days, I can see my style can be described in three words: classic, comfortable, and . . . striped! I’ll take it. So what’s your style? 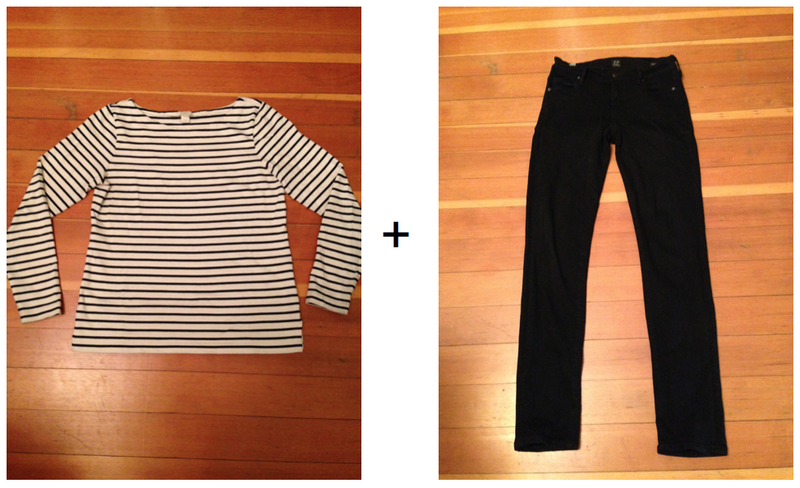 Have you ever tried to put together a capsule wardrobe? Post your comments below!